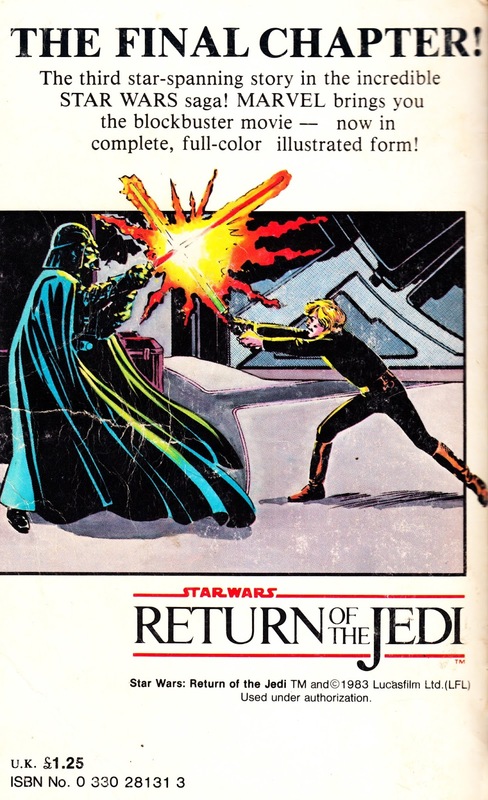 From 1983: the paperback release of Marvel's RETURN OF THE JEDI adaptation. This is the (nominally) British version with the dollar price substituted for a UK price. This was sold widely in the UK, I got my copy from Colchester's Martins the Newsagent (actually it was Martins-the-pretty-much-everything as it was a large store that also sold books, entertainment, stationary and boasted a coffee shop. It later became part of the John Menzies chain and, despite an extensive refit, closed after the chain was purchased by WH Smiths... basically an expensive way of eliminating their competition) in the summer of '83. This isn't that copy... I bought this replacement from a secondhand book store a few years ago. With the exception of the price change, this is identical (right down to the spelling "mistake" on the cover) to the US edition. Confused buyers even had the chance to subscribe to Marvel's US monthlies courtesy of a back-of-book house ad. It was either this or the Super Special magazine that wrecked Lucasfilm's careful plans to keep the movie's plot under wraps until opening day. Marvel's distribution proved too efficient and copies hit the stores before the film was released. Whoops. Marvel Super Special issue 27. 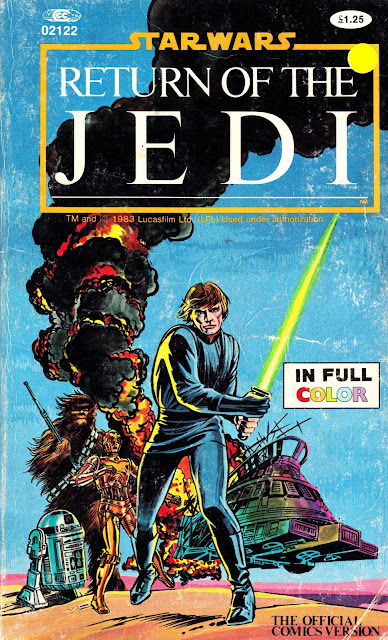 A four-issue RETURN OF THE JEDI limited series (the first time a movie adaptation hadn't formed part of the core monthly's run). Britain's RETURN OF THE JEDI weekly (twice: in 1983 and 1986). The 1983-published British RETURN OF THE JEDI ANNUAL. And a whole bunch of reprints since. they certainly got mileage out of that one didn't they ? I seem to remember a story about Mark Hamill discovering the adaptation in a comic shop before the movie's release and once Lucasfilm got wind of this, the comic was quickly pulled from the shelves.
" and then darth vader , Anakin skywalker, luke's father, died. " in the novelisation long before I ever saw the movie itself.